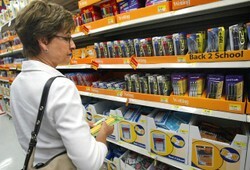 August is the unofficial start of the back-to-school shopping frenzy. Retailers court students and their parents in earnest, eager to sell them everything from flashcards to the new must-have sneakers or laptops. States give shoppers a break, too. At least 12 states – including Alabama, Florida and North Carolina – declare the first weekend of the month a tax holiday, allowing shoppers to purchase clothes, shoes and school supplies without the burden of state sales tax. Their efforts are well placed. Close to 70 percent of consumers plan to spend up to $500 this back-to-school season, and 50 percent plan to do their shopping in August, according to a survey released last week. Basic items such as notebooks, binders and pencils are at the top of most shopping lists, but 68 percent of those surveyed plan to purchase new clothes for their students and 42 percent will drop some cash on a new backpack, according to the survey, which polled nearly 2,200 online shoppers. To avoid overspending, parents should hold off on shopping for school supplies until they have a list from their student’s teacher, advises Elizabeth Mejia, executive director of Communities in Schools of Miami, a dropout prevention program. Items typically on those lists include paper, highlighters and folders, she says, but some high school teachers recommend a few off-list items as well. National news outlets such as the New York Times and Wall Street Journal offer discounted subscriptions to students, which give them access to digital and print editions of the respective papers. High schoolers with tablets or mobile devices – which accounts for most teens – can often save by subscribing just to the online option. Students need a place to store that information too, Laura Latall, an English teacher at Lebanon High School in Missouri, told U.S. News via Twitter. Google Drive is free, and allows students to upload documents, videos and other files – think homework, presentations and research material – and access them from any computer or even a cell phone. Students can also share the files with classmates and teachers. The most important thing a teen can bring to class each day won’t appear on any shopping list, though, says Judy Hirshey, an AP history teacher at Conroe High School in Texas.